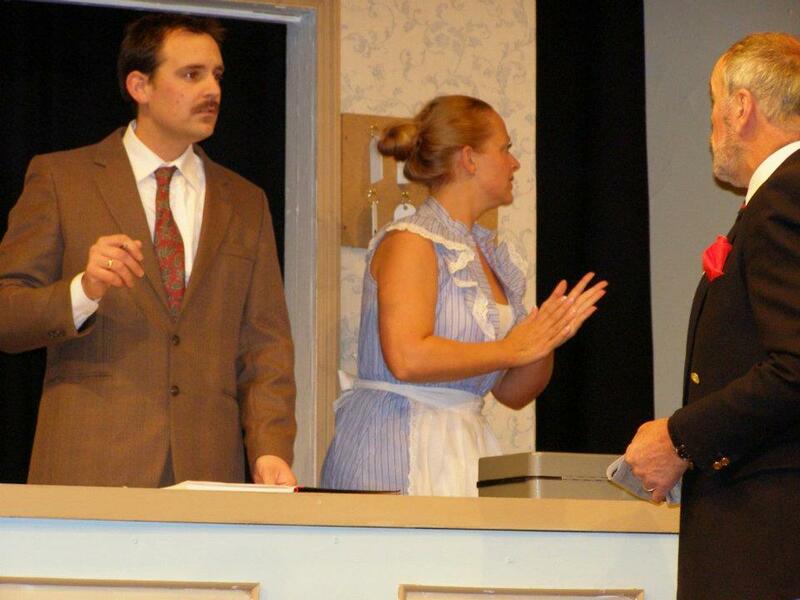 We performed three 'episodes' of Fawlty Towers - The Hotel Inspectors, Communication Problems and The Germans. The episodes were the scripts from the television programme, focusing on the tense, rude mannerisms of Basil Fawlty, his bossy wife Sybil, chambermaid Polly, the hapless Spanish waiter Manuel and their attempts to run the hotel amidst farcical situations and an array of demanding and eccentric guests. Ryan Price-Stephens, Gareth Price-Stephens, Sarah Jones, Trevor Howlett, Craig Price-Stephens, Frankie Baskerville, Steve Christmas, Claire Watts, Emma Percy, Steve Dobson, Matthew Oliver, Val Rosser, Simon Divall and Gwen Livingstone. To view more images, please click here. 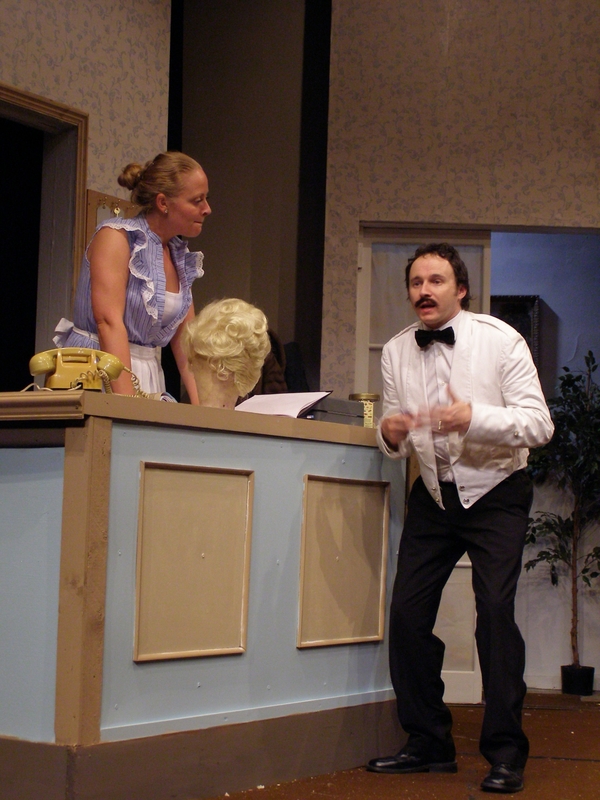 Trying to recreate such an iconic television programme as Fawlty Towers on stage is a huge task – but the ambitious cast of Blackwood Little Theatre have never been afraid of a challenge. And they hit just the right note as they put on three of the most famous episodes from the 1970s’ series - The Germans, Communication Problems and The Hotel Inspectors. 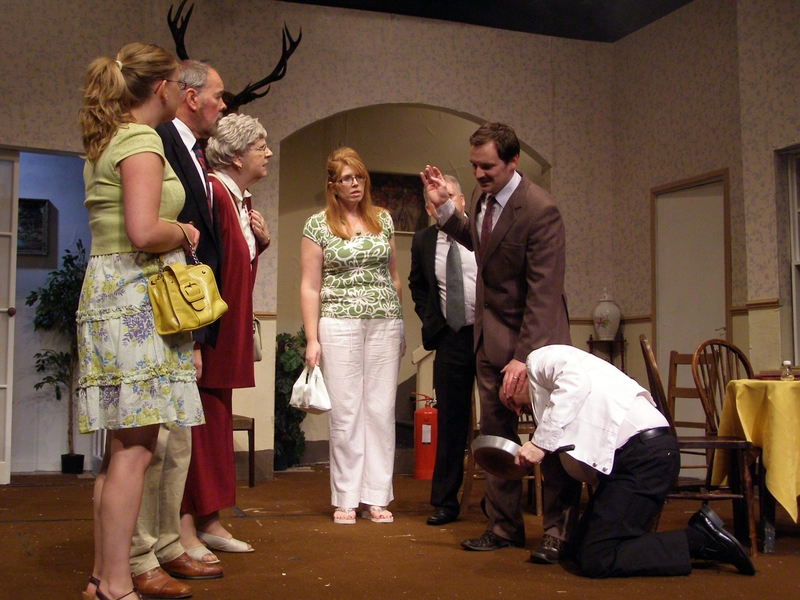 Mark Thomas has the enormous task of emulating John Cleese as the incompetent hotelier – with a great gift for being rude to his guests - and although seemingly a little nervous on this first night, he quickly grows in confidence through the three acts and he certainly looks the part with his moustache and brown suit. At his best when he is shouting, bawling and making faces at the clientele, Thomas is well supported by the talented Graham J. Evans as the bumbling and confused Major, and by Ian Dinham, making his first appearance with this company as the Spanish waiter Manuel. Peta Maidman as Sybil and Shelley Bethan Morgan as Polly also rise to the occasion while Yve Price excels as the difficult and hard-of-hearing Mrs Richards. Jerry Grummitt also gives a very good performance as Mr Hutchinson in the Hotel Inspectors. Under the directorship of Neil Maidman, these episodes are all well-rehearsed and flow well, although there are one or two occasions in some of the more challenging scenes, when it seems a couple of the performers become a little lost and there are a few missed lines. A clever set, created by Peter Musto, enables the action to move seamlessly from lobby to dining room, to hospital scenes– and there is great attention to detail in creating the 1970s set, down to having the old £10 notes. All in all, this is great fun and leaves you wanting to see more – we could easily have sat through another couple of episodes!